Hold on tight as CBBC vloggers Laura, Rhys and Myles explore another epic week on CBBC, including brand new The Dumping Ground, DIXI and All Over The Place: Asia. Browse content similar to Episode 36. Check below for episodes and series from the same categories and more! on our journey through this week's CBBC. Pass me the tutu, Kevin! It's Whoops I Missed The Bus! Next thing you know, they'll be saying unicorns didn't exist. They did, they were just a posh type of horse. ..and Laura has got all the latest goss on Dixi. I mean, that's really mysterious, right? 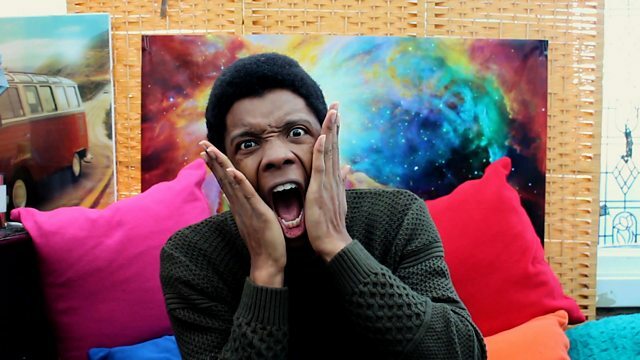 Now, prepare to delve into this week's CBBC. We have some expert guides to lead us on our adventures. It's our vloggers, Myles, Rhys, and Laura. CBBC guide Laura reporting for duty. Ah...I did not realise that was permanent. It's Rhys. I'm trying to spell Rhys. are once again roaming a great continent of Planet Earth. This time, it's Asia, and they're really going for it. They're practically all over the... Oh! Now I understand the title. This week, Cel and Ed got to visit the ancient Osaka Castle. I mean, Japanese castles are the coolest. And they must be pretty sturdy to survive that many years. Three times? What, was it made of cardboard or something? Did they have to keep rebuilding it every time a gust of wind blew by? Is there even anything in it? Did he say "gold tea room"? and he just couldn't keep his hands to himself? "Gold! Argh! No! Oh, gosh! I've just spilt it all over your table. "Gold! Argh! No, it should still work. "I'll just wipe the table... Gold! Argh!" as Ed and Naomi visit the temples of Wudang Mountain. Man, I wish I could visit those temples. I wonder what the monks get up to there. and love walking up the steps. Handy, as it's a three-hour walk to the top. I mean, who's got time for that? -Oh...oh, man... I thought I wasn't going to make it. some really incredible stuff in All Over The Place Asia. to join them in the next series? You want me to be a part of the next series of All Over The Place? All Over The Place Antarctica? Hello! Welcome to All Over The Place Antarctica. Um...on second thoughts, I can't. I'm making food art with Ricky from Art Ninja that week. And the party does not stop here. It's over to our most talented 15 Second Fans. But meant for the professionals, you won't make any money. is Show Me What You're Made Of. It's because five children, they do so much yucky things. They have to do it, and they travel to so many countries. I love The Next Step. I love to watch the episodes. Bye! Great work, mini vloggers! Do you have something to say? and send it to us through the Whoops web page. and sets himself a challenge. Keep your eye on the ball. Blow the whistle, ref. I thought I'd take a little break. I think we should do something a bit sporty. What about a little kick-up competition? Right, guys, we are going to count him, yeah? No, you can't count me in. Ready? Here's for a ten. Oh, it's gone over the fence! It's gone over the fence. I felt like an old man, kicking that! Cameraman Simon always thinks he's good at football. Simon, give me that. In you go. -You ready? You ready for this? I can just get this shot. There it is. Right, you ready? I think I beat you at your job, and that's filming. You watch, when you see these shots. We've got another cameraman who always comes ready for sports. Come on, Tim, in you come. -I'll do it with the camera. -Do it with the camera? -I tell you what, this team, they can't kick a ball. -Do you want to go? Oh, he drew with Sege. Right, who is next? So, what have I got to beat? I bet he don't. I bet he don't. With drama, secrets and a mysterious gloved hand. Keep on checking Dixi for more of my work. Because none of you can stop me. And what else has it got? Oh, yes, phones. They were right behind me! A lot of people using their phones a LOT. going for a run or skateboarding...? but bad news - it's been taken over by The Nameless One. You can't shame The Nameless. You can't fight a shadow. It's up to Shari and the gang to get it back. like the kids from MI High. Oh, or Harriet the spy. Going to creep around this wall. Ow. Ow! Ow, this is heavy. Maybe she should try being a little less creepy. Why would anyone try to make Mimi look bad like that? to make the truth look completely different. Wait, wait, that hasn't been badly edited. That was just footage that wasn't supposed to be seen. to make them seem something they're not. I accidentally offended Myles, once. Laura, why are you being so mean? It's not like I've done anything to you. I shouldn't really be filming this, this is quite personal. It's not like I've eaten your cereal or read your diary. Wait, Myles, what is this about? You said I was the worst. -Did you watch the end of it, Myles? Well, that explains it, then. That must have been not my fault, but my...internet connection. Hang on, back up a minute. How did you know I have a diary? Have you read my diary? Oh, I'm on a... I've got to get on the plane, Laura. "Em-em-em". It means "not much". But of course, the school play falling to pieces. and turn your dreams to nightmares. Could it not be a high-pitched voice instead? -And turn your dreams to nightmares. So, time to get spying and work out who The Nameless One is. I'll leave spying to Shari and the gang. there is no more old footage of me in this vlog. both what my bedroom is referred to as well as the CBBC TV show. Oh, Myles, you're so witty. I do need to clean it up. -Are you bothered that no-one likes you? ..and there's the usual Dumping Ground drama as well. You do know the moon landings were faked, don't you? It's too loud, too loud. So there'll be no footprints, cos they were never there. now suddenly believing we didn't land on the moon. Next thing, they'll be saying unicorns didn't exist. We can't afford all of them. Someone's got to go. -And we're agreed it's him? -Well, it's what we said, isn't it? like they're thinking of getting rid of him. that's making it seem a lot worse. "Ten reasons the moon landings were definitely faked?" Shush! Stop implying a mood. now it's jumped to the worst conclusion in existence. "Number six will blow your mind?" Don't read number six, please. to run away to an observatory to find out the truth. Oh, my goodness! It's beautiful! But there are things that still need straightening out. at the opening of that new theme park. They were taking Ryan to a theme park for some thrills. Ryan says he should go instead. Joseph should go. He deserves it more. Not quite the same as going to space, but sure. because you can sit in them and eat popcorn there. Can't do that with the moon. Good work, Myles, your talent knows no bounds. are itching to get on and show us what they are made of. and then put it into a small cup. I am Miss Hardbroom, deputy headmistress. I was impersonating Miss Hardbroom off The Worst Witch. I'm the new studio head of The Next Step. even though I'm still with James, who is in London. but I'm the head of the studio. I have to get over it. I'm Riley from The Next Step. -We were Martha from So Awkward. Want a piece of the action? and remember to tell us who you were at the end of the video. It's all on the Whoops web page, you know. Now, what's better than a homework-free weekend? it's all the very best bits from CBBC this week. I don't get it. Why is this new girl such a big deal? I knew we should have approached in stealth mode. They want a show, let's give them a show. "Look at me, my parents are famous!" So, jumping over a fence and your trousers splitting. I think it's just trousers splitting. than sleeping through the alarm? I think it is, I think it is. The next one is when you call your teacher "Mum". Is that more or less unfortunate than ripping your trousers? -We think less? The cameramen agrees. That's something. Let's have a look. for All Over The Place Asia? Uh, I was in... Hailand. And what is the capital city of Thailand? You've got lovely dental work. And what is your favourite Thai dish? for all of this and even more. Oh, no - hang on. Ah, we didn't think this through. Plus, a chance to find out which of The Dengineers gang is better at keepy-uppies.